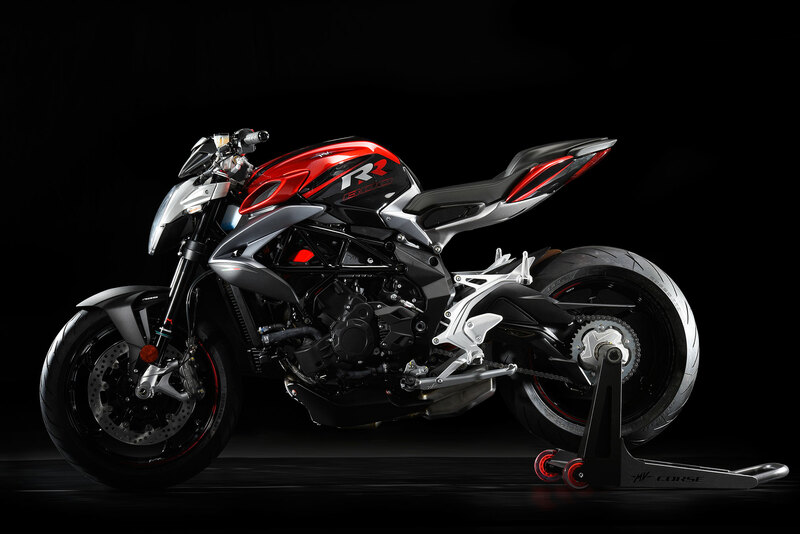 The revolution, by MV Agusta, has a new name: Brutale 800 RR. 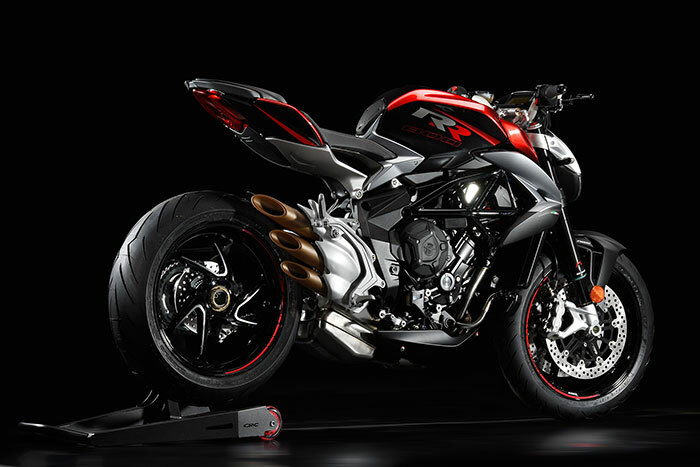 updates and implemented electronics the experience of the MV Agusta Brutale RR is even more intense, immediate, fluid and adrenaline inducing: 140 hp from launch, a full torque curve, complimented with the best suspension and control package. So, MV Agusta strengthens its technological leadership in the year Euro IV regulations are introduced, reinterpreting the same performance led strategy that make it an icon in motorcycling: the ‘bad’ Schiranna naked, benefits from a thrilling riding experience accompanied with an exceptional level of refinement: less vibration, noise reductions of 50% compared to the previous model, lower emissions, more power, and less demanding set-up. A dream constructed around acceleration and design. RR stands for maximum power: with 140 hp at 13,100 revs / min and a maximum torque of 86 Nm at 10,100 rpm / min generated by the presence of two injectors per cylinder. 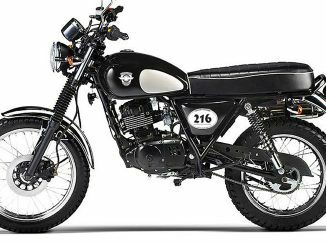 A package specifically developed to retain the riding dynamics and sheer exhilaration of the models prior to the introduction of the new restrictive emission regulations. The result is astonishing; a true technological leap with a refined engine cylinder head developed for noise suppression to the benefit of augmenting ‘permitted’ sound by MV: namely those generated by the combustion. With the introduction of new components such as a harmonic damper, a new mechanical cam-chain tensioner, new camshafts, new valve guides, all completely redesigned and utilizing new materials to minimize stresses and vibrations. Noise reduction also extends to the side covers of the engine, which also act as engine protectors. An entirely new countershaft, starter motor, and primary gear drive, are aimed at improving the reliability. The designs of the transmission gears are also redesigned to achieve better meshing and therefore smoother transitions. 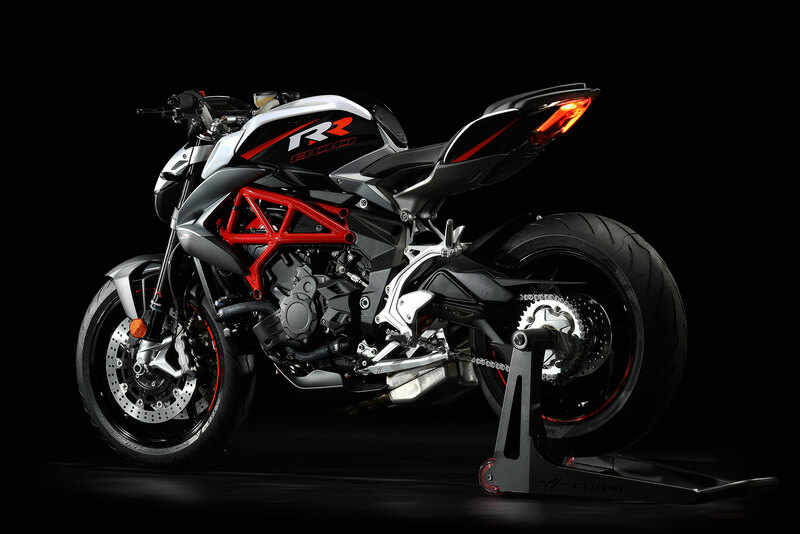 The new Brutale RR 800 take the model presented at EICMA last year to new extremes. The classic MV naked was reshaped and reinterpreted; new aero forms were introduced with respect for the classic style that defined the Brutale DNA typified by the unique front headlight profile and distinctive ‘organ pipe’ silencer which has increased both in profile and volume (+ 3 lt). 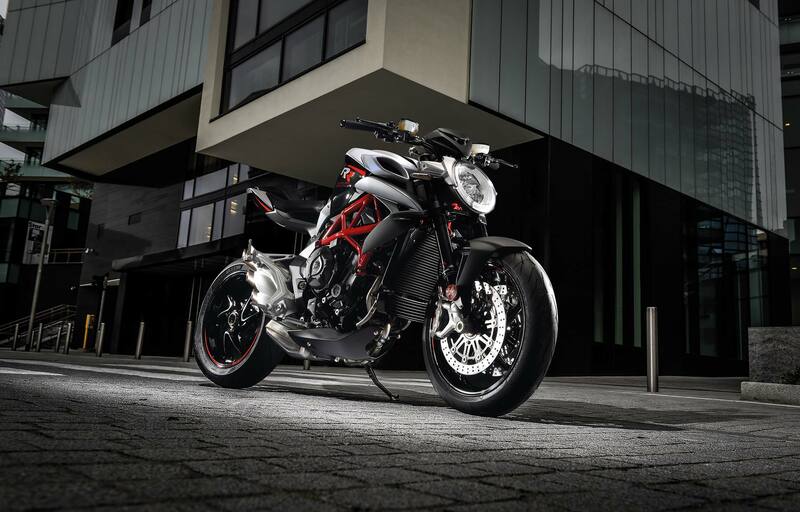 Other distinctive elements of the new Brutale include the split seat, retractable passenger grab handles a graphic LED rear tail light and the compact LED indicators. The strongest feature is the futuristic signature light alloy structure of the subframe, which connects to the trapezoidal fuel tank (16.5 litres) creating a visually front biased volume that accentuates the aggressive character of this naked whilst retaining a uniquely balanced compact proportion. Introduced specifically for the RR version, are new forged wheels with a specific contrasting surface treatment. More power is managed by the introduction of a new steering damper, with eight levels of manual adjustment. The hydraulic Marzocchi upside down fork utilize lightweight gold anodized aluminum stanchions (comprising an external compression adjustment system, extension and spring preload) and an adjustable Sachs rear monoshock. The braking system is entirely Brembo with a pair of floating front discs 320 mm diameter and fourpiston calipers, while the rear operates a twin piston caliper on a 220 mm diameter disc. To top it all, the Bosch ABS 9 Plus, ensures safety and performance on all road surfaces. 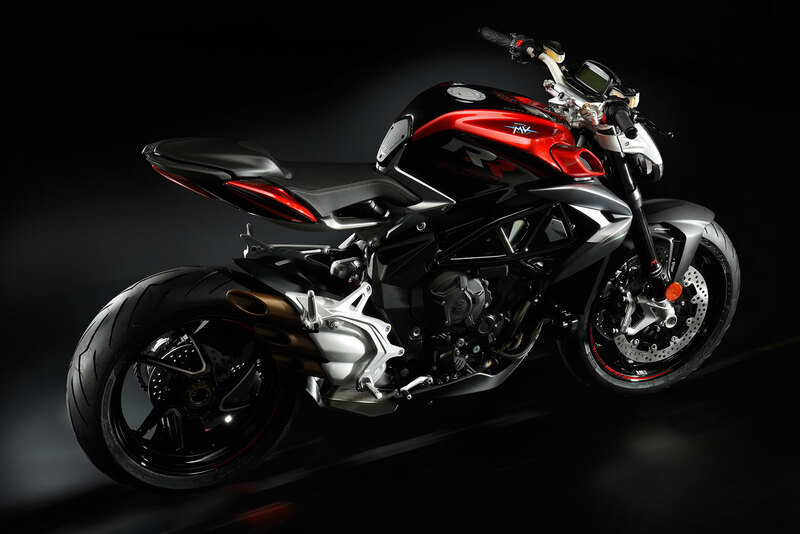 The new Brutale RR 800 is available in two colors: Ice / Carbon Black Metallic and Red Shock Pearl / Carbon Black Metallic. The new Brutale RR 800 takes the model presented at EICMA last year to new extremes. The classic MV naked was reshaped and reinterpreted; new aero forms were introduced with respect for the classic style that defined the Brutale DNA typified by the unique front headlight profile and distinctive ‘organ pipe’ silencer which has increased both in profile and volume (+ 3 lt). Other distinctive elements of the new Brutale include the split seat, retractable passenger grab handles a graphic LED rear tail light and the compact LED indicators. 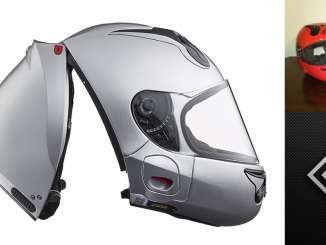 The strongest feature is the futuristic signature light alloy structure of the subframe, which connects to the trapezoidal fuel tank (16.5 litres) creating a visually front biased volume that accentuates the aggressive character of this naked whilst retaining a uniquely balanced compact proportion. Introduced specifically for the RR version, are new forged wheels with a specific contrasting surface treatment. More power is managed by the introduction of a new steering damper, with eight levels of manual adjustment. The hydraulic Marzocchi upside down fork utilize lightweight gold anodized aluminum stanchions (comprising an external compression adjustment system, extension and spring preload) and an adjustable Sachs rear monoshock. The braking system is entirely Brembo with a pair of floating front discs 320 mm diameter and four-piston calipers, while the rear operates a twin piston caliper on a 220 mm diameter disc. To top it all, the Bosch ABS 9 Plus, ensures safety and performance on all road surfaces. Max. power – r.p.m. (at the crankshaft)** 103 kW (140 hp) at 13.100 r.p.m. Max. torque – r.p.m. 86 Nm (8.77 kgm) at 10.100 r.p.m. Europe/UK MSRP Price: £13100* GBP (On the road charges of £300 apply to the quoted prices) *Prices may vary from country to country due to local import duties and tax.